A fire in your home or office causes substantial damage to your property and creates chaos in your life. From substantial structural damage to light soot damage, a fire can make you feel like your life may never get back on track. 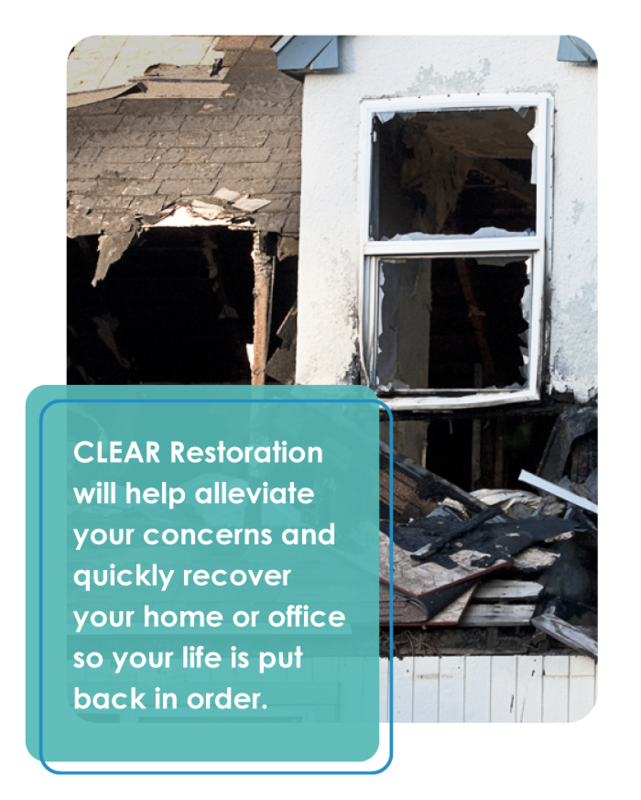 CLEAR Restoration will help alleviate your concerns and quickly recover your home or office so your life is put back in order. CLEAR Restoration’s experienced team of fire damage restoration experts will quickly arrive on site to address all safety and structural concerns. We will perform any necessary emergency board-ups, construct temporary bracing and framing to ensure the property is safe, and build a full restoration plan for your home. Working closely with you and your insurance adjuster, we will execute our restoration plan to restore your home to its pre-loss condition. From structural cleaning and deodorization to carefully restoring your home’s contents and your precious belongings, you can rest assured that we will exceed your expectations and help you quickly put this unfortunate incident behind you.